Food, as a concept, is remarkable. The body requires a certain amount of caloric intake to continue to function at optimal levels. It cares not whether it tastes good, looks good, or smells good as long as it provides fuel to continue to function. But we as humans are created to enjoy things, so food then becomes more than just sustenance, it becomes about comfort and experience. During World War II, the US government was more concerned that soldiers had enough calories to march and civilians and refugees had enough to endure. Soldiers longed for a taste of home and for many, ice cream was that reminder of better days. However, refrigeration was an issue and logistically, ice cream was difficult to ship overseas. So some intuitive pilots learned that during bombing runs, the freezing temperatures at altitude were perfect for making ice cream. Strapping buckets of ice cream mix to the rear gunner’s compartment before missions, the vibration of the plane and undoubtedly the machine gun fire churned the mix, and when they landed, voila, a perfect bucket of ice cream. It’s this story that inspired Stephen DiMare to create Mayday Ice Cream. DiMare already had frozen treat success as the owner of the popular Hyppo Ice Pops. His first Mayday Ice Cream shop opened in St Augustine and soon thereafter, established his second location in San Marco on Hendricks Ave. Mayday Ice Cream offers handcrafted artisan ice cream in a variety of unique flavors such as Blackberry Earl Grey and Rose White Chocolate. They also hand make their own waffle cones, sprinkles, and cookies called French galettes. Mayday Ice Cream offers various scoop sizes, from child size ($3.50) to triple scoop ($6.50). 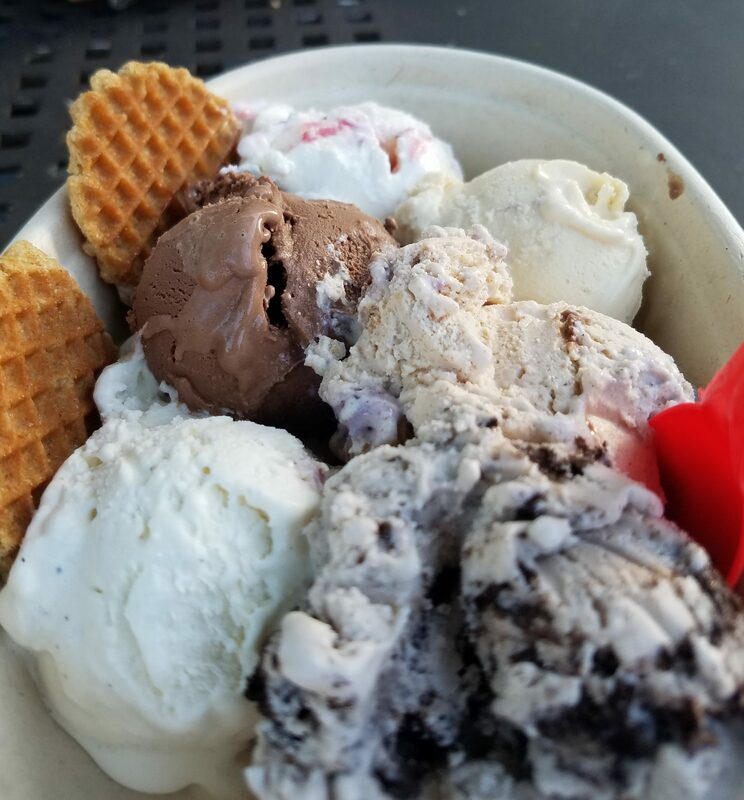 But with so many flavors to try on my first visit, I decided to go with the Ice Cream Flight ($8.00); six small scoops of whatever flavors you want. You can also get a pint of your favorite flavor to enjoy at home ($8 each or 4 for $28). They also offer ice cream sundaes and coffee. To avoid contracting “paralysis by analysis,” I checked out the flavors on their website and made my choices before making the trip. But once I walked into the cute little shop and seeing all the flavors in person, I was frozen (pun intended) with indecision. Luckily there was a bit of a line, so I quickly refocused and made my choices to the very patient worker behind the counter. Sessions Chocolate – This was by far my favorite of the sextet. The texture was incredibly smooth and melted into a smooth cream on my tongue. There wasn’t a gritty texture of ice crystals that you sometimes get with industrial ice cream. This was made with love and care. The chocolate flavor was rich and deep. It had the sweetness of American chocolate, but with the depth and richness of a European chocolate. It was fantastic and the first scoop to disappear from the dish. Cookie Crush – Cookies and cream is my usual go to ice cream flavor. I love Oreo cookies and ice cream seems to be its natural habitat. Mayday’s Cookie Crush is like cookies and cream cranked up to 11. Every spoonful had Oreo cookie in it. The ice cream tasted just like I split an Oreo, licked the icing in the middle, and then dipped it in a glass of cold milk. Queen Salted Caramel – I’m a big fan of salty/sweet combinations with salted caramel being on the top of that salty/sweet list. This Queen Salted Caramel is something else to behold. It had a beautiful, slightly tan color. The caramel tasted like real caramel and not those sugar cubes of caramel you buy at the local MegaLoMart. The pink sea salt not only added the salty element needed for salted caramel to work, but it also elevated and enhanced the caramel flavor. Triple Vanilla – Some use the word “vanilla” as a derogatory term, as in “That is so vanilla” or “How does Vanilla Ice have a home improvement show?” But there’s a reason vanilla ice cream is America’s most popular flavor and Vanilla Ice its most meme-able representative. It’s that old faithful flavor you know will never let you down; whether enjoying a bowl of it on the couch during a Netflix binge session or rollin’ in your 5.0 with your ragtop down so your hair can blow. Mayday’s version, like the Session Chocolate does to chocolate, takes vanilla and turns it all the way up. It’s smooth, creamy, and delicious. Vanilla is definitely on the forefront and will make you expect more of every other vanilla ice cream you’ll ever have in the future. Blueberry Toast Crunch – Because Mayday decided to go with blueberry compote instead of straight blueberries mixed in, the blueberry flavor was integrated throughout the ice cream instead of short bursts of blueberry. The cinnamon was also strong throughout. I didn’t ask exactly how they made this ice cream, but it tasted the cinnamon toast crunch was enhanced by actual cinnamon as well. If you’re a big fan of blueberries, this is the flavor for you. Strawberry Fields – This was my least favorite. Not to say it wasn’t good, because it was, but the St Germaine Elderflower liquor was a little much for me. I’m not a huge fan of floral flavors in food in general. They did offer a straight strawberry flavor and in retrospect, I maybe should’ve gone with that, but I love trying new things. I may end up not liking it, but it doesn’t mean it’s bad, it just means it’s not for me. For a textural countermeasure, I got a couple of the French galette cookies. These are waffle cookies and are included with every scoop. These cookies were great. I expected them to be a thin, crispy, wafer-like cookie, but was surprised that these had some heft and thickness to them. They were dense, but were a perfect compliment to the ice cream. I was so enamored with the ice cream, I sort of forgot about the galattes and they sat in the ice cream for a bit. Because of their thickness and weight, the galettes were able to soak up the melted ice cream without losing structural integrity. These were a great break in the silky smooth texture of the ice cream. I may not be a soldier, but I can understand the concept of bringing comfort to food. 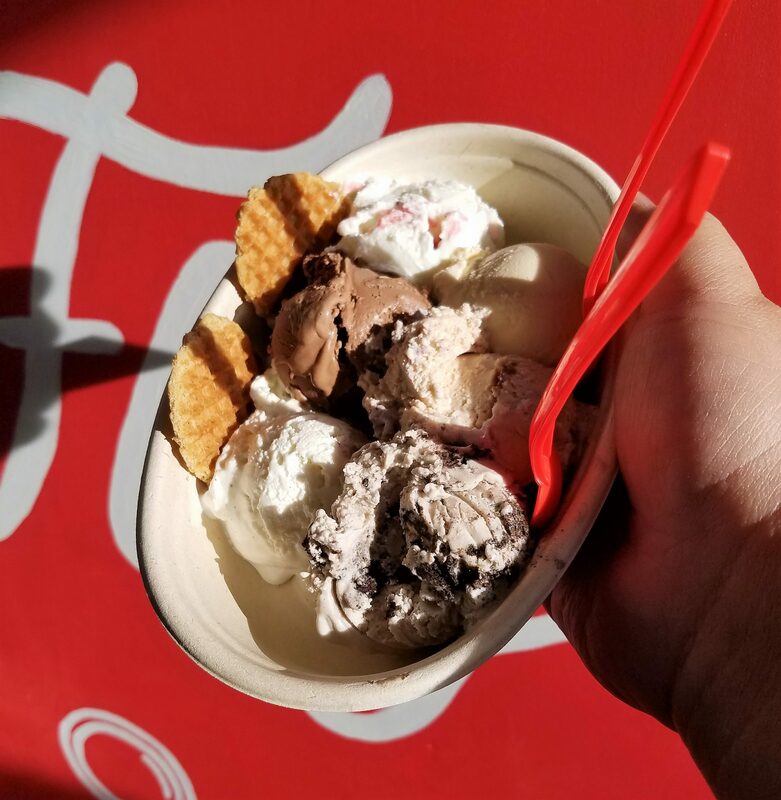 Sure, the BOGO ice cream offers in your weekly grocery store ad will get the job done, but just like the WW2 pilots of yesteryear, it’s worth the effort to make something that not only feeds your body, but also feeds your soul. Mayday Ice Cream is worth the effort. Tagged desserts, Desserts/Ice Cream, Family Friendly, Ice cream, kid friendly. Bookmark the permalink.